As I look at Angel calmly sleeping beside me as I type this post, I cannot help but smile and it leaves me with this warm fuzzy feeling. 2 years and 2 months back, I held this tiny being in my hands for the first time, clueless about how I would care for her and protect her. Well its not that I have all the answers now but somewhere along the way I have realized that you figure it out. Thinking of how much I have changed as a person post motherhood, this is something which makes me immensely proud as I have grown as a person. Maybe I have becomes selfish somewhere (in my own interests), I have taken time to think about myself, my happiness as I know my thoughts, actions, reactions are all going to be carefully scrutinized and imitated by this little one. 1) Live life sans the guilt: One thing that follows us Moms everywhere is guilt. As a working Mom, guilt of not spending enough time with the child, as a SAHM - I am at home the whole day, am I doing enough for my child? As a Mom of a lean baby, as a Mom of a chubby baby, as a mom of a quiet baby, a playful baby, a toddler, a teenager, everyone. In my case I learn my lesson hard but in hindsight this was meant to be - to teach me a very valuable lesson. My daughter was 11 days old when I started her on formula feed as advised by the pediatrician. It was a heart breaking moment for me realizing that I couldn’t satiate her hunger. Somewhere I felt I had failed miserably as a Mom, the guilt ate me up badly. I suffered for days but one fine day, something snapped inside me. I realized what a futile thing this was- this was something beyond my control, it was not that I deliberately chose to not feed her. Was it right to consume myself with so much guilt which in turn affected my wellbeing and my baby as well. Was feeding her my milk the only thing which created a bond or a test of motherhood? 2) Adept at Multitasking: Before motherhood came calling, it’s not that I was ever a single tasker. Being a working woman, multi-tasking is something I always did and did it quite well. But the birth of my daughter brought about a completely new level of multitasking in me - can you imagine a baby sleeping in your arms as you furiously type a blog post on the blogger app on your iPhone. I could have never dreamt of taking so much pain, but you will find this is a regular thing with me on weekends. Weekends is the only time I can devote to writing and my baby wants to snuggle close and be held in the arms. If I were to doze off, there is slim chance she will allow me to write peacefully when she is up and running and that’s why this novel way of writing my posts. Once I have written a draft version I edit it on the laptop in a jiffy and post it. Many of my posts written in such a comical pose have in fact done exceedingly well. 3) Spread love, don’t spew venom: I often wondered looking at SAHM's "what do they do the whole day at home? I looked at a Mom who had her tummy bulging out and thought "why doesn’t she work out or control her diet? All this was before I became a Mom. Now I look at all the Moms around, in all shapes and sizes, some fit and lean, some yet to get there, some dressed like a model and some in their pyjamas and hair tied loosely in a bun, those tired yet happy faces and I know we all sail in the same boat. I no longer judge- we all have our struggles and triumphs, our own circumstances which may coerce us to make some hard decisions. We all are mums and need love, not judgement. 4) Shed the inhabitations, speak up: I took to blogging when my dotty was 2 months old. I started off writing a post on her birth story but I had this strong urge to write about my struggles as a bottle feeding Mum. I was certain there are many others around but I couldn’t find anything (literally nothing) written on this topic by Indian mums. I found my solace reading a post by an American mum, that provided me much needed support that I am not alone and yes this happens, does not qualify you as a bad Mum. I then wrote about this, candidly sharing my own story. Though I knew people will judge, I did it for myself and for Mums out there who needed this. Post that, there has been no looking back. I write my mind and this is a big lesson in itself for me. To openly express myself without fear of what others think, My success as a writer is largely attributable to the fact that I speak my mind. 5) Selfish Mommy- I take time for myself, which I did in the past as well but with a baby and a full time job with an Investment bank it isn’t easy hun. But I do realize that unless I am contended and feel fulfilled as a person, I can never make my loved ones happy. It’s an important lesson that I want to imbibe in my daughter too. As women we are always conditioned to think of others first and we end up being the loser as hardly live for ourselves. I would want my daughter to keep herself first. As Kareena says "Main apni favourite hu" This resonated so well with me. Unless I value myself, take time to do things I love, there is little chance that my daughter will value herself. Motherhood is that roller coaster which takes you on a high one moment and before you can fathom it brings you down to the ground. What have been your leanings as Mum, do share your story too. Live life sans the guilt..so true. As moms we feel guilty for everything. Its important to be little selfish..agree. Lovely post Akshata. 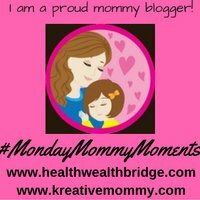 Thanks for linking up with #MondayMommyMoments. Thanks Deepa for a very good choice of prompt and your comments as well! lol ok forward to a long association with you and Amrita! What a wonderful post.Even I bottle fed my infant due to a medical problem at around 15 daus of age.It was heartbreaking ,but it was God's will.Life as a mother makes you open to judgement whatever you do. Why is speaking English at home a taboo? Honey hide that baby bump, will ya?